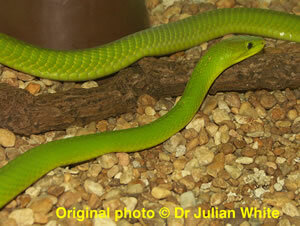 Large in length, slightly compressed, very slender bodied snake with a medium to moderately long tapering tail. Can grow to a maximum of about 2.80 metres. Head is narrow and elongate, with a distinct canthus and slightly distinct from neck. 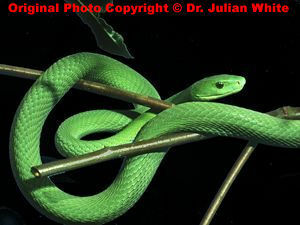 Neck may be flattened when snake is aroused, but there is no real hood. Eyes are medium in size with round pupils. Dorsal scales are oblique, smooth and narrow. Dorsal scale count usually 25 - ( 21 or 23 ) - ( 15 to 19 ). Forest, woodland, coastal dense bush and thicket and dense montane forest up to about 1700 metres. Not usually found in open terrain. Often found in thickets and farm trees ( citrus, cashew nut, coconut and mango ) which offer plenty of shade. In coastal east Africa it is known to enter houses and often shelters in thatched roof dwellings. Diurnal, arboreal and secretive snake. Alert, nervous, excellent climber and extremely agile snake. Sleeps at night in a tree coiled up in leafy clumps rather than seeking a tree hollow ( although sometimes found in them ). If disturbed it will quickly retreat, often ascending high up into the trees. If cornered, it is reluctant to threaten ( rear up, spread its narrow hood and gape the mouth ) or bite, but will do so as a last resort. Actively pursue their prey, striking rapidly and often until prey succumbs to the venom. Feeds almost exclusively on birds ( including bats ), their eggs and small mammals. They will descend to the ground to pursue prey. 60 to 95 mg ( dry weight ), U.S. Dept. Navy (1968) ( Ref : R000914 ). 60 to 95 mg ( dry weight ), Minton (1974) ( Ref : R000504 ).